Ad: The Star Wars Mystery 3 3/4-Inch Figures - EE Exclusive is up for pre-order right now and includes Free Shipping in the USA! Specifics are not yet posted, but the set includes 6 different 3 3/4-inch scale action figures that are promised to fit in well with The Vintage Collection and The Black Series. More will be announced at San Diego this week. Click here to see more and pre-order yours now! Toys R Us will have an exclusive Black Series 6-inch set of Star Wars Droids during San Diego Comic-Con, but will not be at Comic-Con. As I work for Entertainment Earth and will be working on the booth for the show, I reached out to me for confirmation - and I can confirm this item will be sold online. (I also assume at stores later.) The droids are identified as R2-A3, R5-K6, and R2-F2 on the packaging. Entertainment Earth Booth #2343 will be selling a number of other items for Toys R Us as well as their own exclusives, including some other Star Wars and Hasbro items. 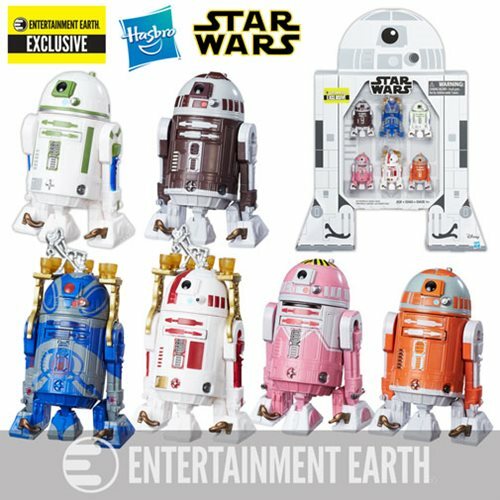 Click here to see the droid item at Toys R Us' web site. 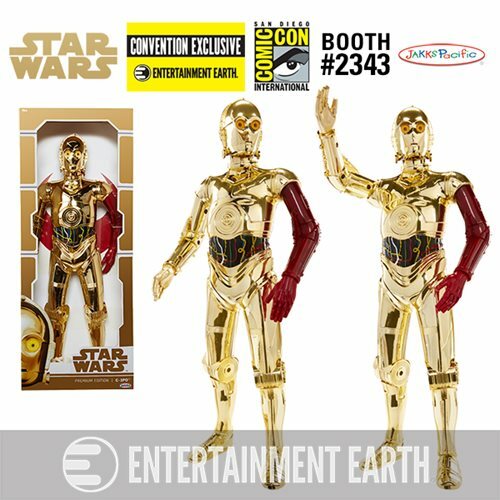 C-3PO is coming to Comic-Con at Entertainment Earth! This 20-inch scale action figure is the first-ever C-3PO in this size, and it comes complete with a shiny gold metal finish you won't find anywhere else. Click here to see it and more details, but you can't pre-order it - it's only available at booth #2343 in San Diego! It's back! The Toys R Us exclusive 6-inch Snowtrooper Officer action figure had a new production run and is showing up in stores all over Phoenix, AZ - and perhaps in your town, too! No obvious changes were spotted, but if you missed it here's your chance to snag one at a reasonable price. I saw them at two different stores so far this week, and it's only Tuesday. Happy hunting! While Hasbro remains silent on their plans for the big show, Mattel rolled out a classic with this one. A Death Star Trench Race set has 3 TIE Fighters and an X-Wing, but in car form with enhanced deco and electronics. $50 for four cars in a fancy box - if you can swing it. Ad: Star Wars Boba Fett Mandalorian Symbol 20 oz. 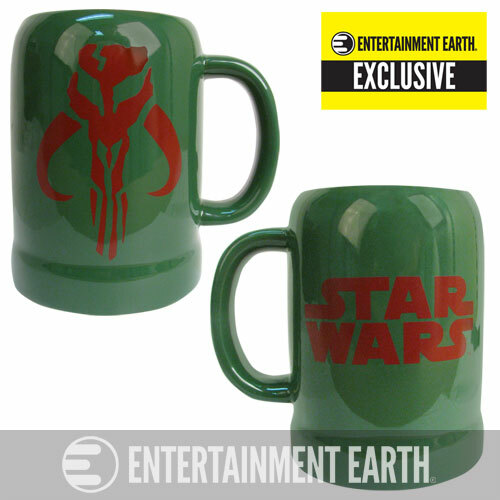 Ceramic Stein - an Entertainment Earth Exclusive! This colorful collectible is $14.99 and due in September. Order yours today! As I write this, auctions for R5-M4 are popping up. This may well be the first-ever action figure labeled "Star Wars Day: May the 4th Be With You" and is being reportedly sold in Orlando's Disney theme park(s). I don't have prices, I don't have specifics, I don't know if it's in Anaheim, and I don't have one yet myself. But I do know you can see one if you click here. UPDATE: Long-time reader TotallyRawe left a comment indicating this is indeed showing up in Anaheim. Buy one! Or two, send me one. Happy hunting droid junkies! 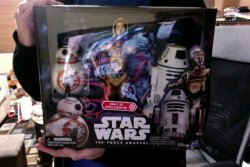 In "news that can scare youse" news, Target stores have a $29.99 3-pack of 12-inch (1:6 scale) droid action figures from Star Wars: The Force Awakens. Given no prior publicity or announcement, these sets include R0-4L0, C-3PO, and BB-8 - not a bad deal. However, don't limit your search to the toy department - I found all of these sets and other toys in the DVD/movie/Blu-Ray section on an endcap. Happy hunting! Kmart Star Wars Kylo Ren Exclusive - In Stock Now! Maybe! Here it is - again! The 6-inch Kmart exclusive Kylo Ren (Starkiller Base) is in stock as of my writing this - you can get it picked up at stores for free, or get it shipped. It's $5 more than the regular version, but sports unique deco on the feet, a base, different hands, and a different lightsaber. I just ordered mine - if you want one, click here to check availability. Update: Don't use Paypal on the Kmart.com web site right now, as it seems to be causing problems. He's back, and slightly bigger than ever (from Hasbro)! R2-Q5 has opening panels with painted arms and a swell finish - but none of the scopes that came with R2-D2 two years ago. Is it cool? Well, I think so, but I'm biased. It's in stock for ordering right now, and you can read on to see if you should care! Hey, it's the Crimson Stormtrooper! Or Magma Stormtrooper, or Lumiya's squad, depending on where you saw red troopers like this first. (I'm voting for Lumiya.) It's pretty awesome - and part of a new boxed set that's available right now. Read on! If you missed it, the R2-H15 is new! It just came out and is showing up at Disney's theme park in Anaheim for about $13. (Thanks for getting me this one, Matt!) Is it worth it? Read on! I'm pretty stoked whenever we get a Stormtrooper with marks of some sort, so last week's Walmart-only Imperial Shock Trooper was a treat. The mold is good, and the Shocktrooper markings from the Battlefront game make it even cooler. Want to know more? Read on! Fresh from the drug store chain, Darth Vader (Emperor's Wrath) is out and about with improved armor deco, a retooled arm, and a new head. It's a decent figure - but it's still basically the same Vader from last year with a few modifications. Want to see more about this 6-inch figure? Read on! Check out Target's 6-inch Poe Dameron - probably in stores now unless it sold out. I got mine online for $10 off, which is where you want to be - it's a good figure, but the likeness on Oscar Isaac toys as of yet could use some work. (He's a tough face to capture.) Should you get this one? Read on!